Written for the Coursera (MOOC) Class ‘Wind, Waves and Tides‘ by the University of Toronto (Nov 2014). 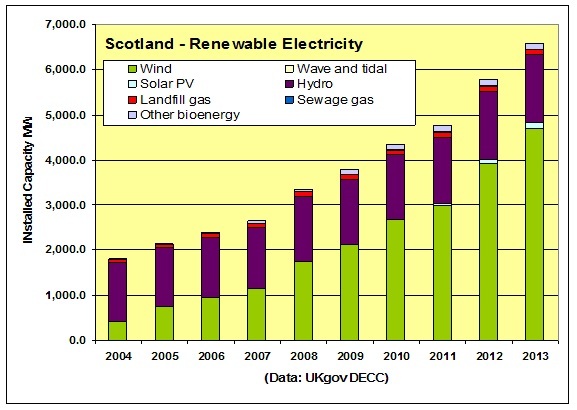 Scotland has 25% of Europe’s wave and wind power potential    , and has a theoretical total wind energy capacity of 159 GW . The Scottish Government has set ambitious energy targets to de-carbonise electricity generation and reduce energy consumption . 100% of Electricity demand to be met by Renewable Energy sources by 2020. Next target of 50% by 2015 is expected to be met. Energy Efficiency improvements by reducing final energy consumption by 12% (years 2005-07 baseline) by 2020. Reductions of 9.2% were achieved by 2011. The Fossil Fuel portion of electricity generation is largely met by one coal fired station, Longannet (2.4 GW) and by one natural gas station, Peterhead (1.5 GW)  . The target of meeting Scottish demand for electricity from renewable sources leaves the door open for fossil fuel and nuclear in exports of electricity to England and Northern Ireland. Retention of some of this non-renewable capacity will help in balancing the grid as renewable sources fluctuate. Scotland currently has pumped storage capacity of 16.3 GWh with scope and plans for expansion  . Both Longannet and Peterhead power stations have been considered for Carbon Capture and Storage technology. UK government investment was withdrawn for the Longannet pilot project, but has funded a study for the Peterhead facility  . Nuclear Power is generated at two facilities, Hunterston B (1.3 GW) and Torness (1.4 GW). Both are towards end of life and have had extensions granted for another 10 years  . The current Scottish administration is opposed to any new nuclear power facilities being built . Energy Storage is an essential technology in matching intermittent renewable energy sources with variable consumer demand. 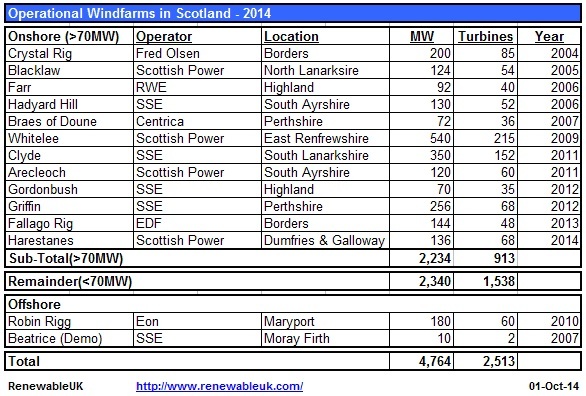 Scotland currently has two large Pumped Storage facilities, Cruachan (440 MW, 10 GWh) and Foyers (300 MW, 6.3 GWh)  . Feasibility studies are underway on another four locations, Cruachan expansion , Sloy conversion (60 MW, 0.4 GWh) , Coire Glas (600 MW, 30 GWh)  and Balmacaan (600 MW, 30 GWh) . Note that power transfer, the rate at which electricity can be stored from or released back to the grid is indicated in MW. Actual storage capacity (energy) is shown in GWh. Divide GWh by MW / 1000 and this is the amount of stored energy in hours at maximum power. The Scottish government has set emissions targets, in law, to reduce production of greenhouse gasses responsible for climate change, in ‘The Climate Change (Scotland) Act of 2009, (using 1990 levels as the benchmark). Target of reducing emissions by 80% by 2050. Target for 2020 is set at 42% reduction. Besides Electricity Generation, Scotland plans to have 30% total energy consumption, 10% transportation (EU target of 10%), 11% of heat energy, powered by Renewable Energy sources. Guidance on how the country shall achieve these targets is provided in the Scottish government publication ‘2020 Routemap for Renewable Energy in Scotland’. 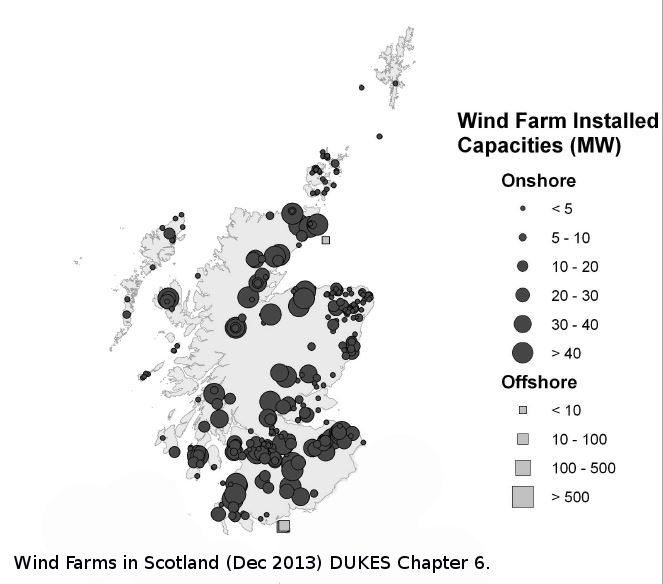 There are currently two offshore and more than 100 onshore windfarms operating in Scotland. In addition to this, another 200 are either under construction, have planning permission or are in planning. Table 1: Operational Facilities 2014. Table 2: Future Facilities 2014. Whitelee Wind Farm (Scottish Power) , near Glasgow is the largest onshore wind farm in the UK, second in Europe. Completed in 2009, it operates 215 turbines each rated at 2.3 MW, giving it a total installed capacity is 539 MW. The total project cost was £300 million, or around £0.56 million per megawatt. Clyde Wind Farm (SSE) , south east of Glasgow, was completed in 2011. It is Europe’s fourth and the UK’s third largest onshore facility. It has 152 turbines and an installed capacity of 350MW. The project cost was £500 million. Viking Wind Farm (SSE & Community) , Shetland Islands, is due for completion in 2019. It will operate 103 turbines and produce 370 MW. The project includes a new high voltage sub-sea cable linking with the UK electricity grid. The wind conditions on Shetland estimate the capacity factor to be 0.44. 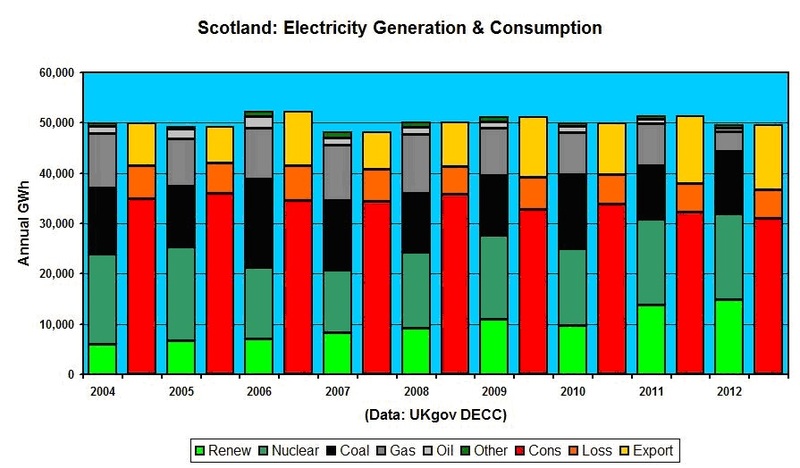 Electricity generation in Scotland remains fairly constant at around 50 TWh per annum . All of the coal generation is from the 2.4 GW Longannet Station with some of the remainder from earlier years intermittently supplied by the 1.2 GW Cockenzie Station which was closed in March 2013 . Much of Cockenzie’s electricity was exported to neighbouring Northern Ireland. Nuclear power provides an annual average base load of just under 16 TWh, from Torness (1.4 GW) and Hunterston B (1.3 GW) stations . The Peterhead power station (1.5 GW) generates the majority of gas sourced electricity at around 10 TWh annually . The Grangemouth petrochem complex is supplied by the 130 MW gas power station. It provides electricity and steam locally, as well as exporting excess electricity to the grid. Permission was granted in 2011 for a 1 GW combined cycle gas power plant at the Cockenzie site, it will be equipped with carbon capture and storage CCS) technology . Installed capacity for renewable sourced electricity is rapidly increasing in Scotland in line with targets set out by the Scottish government . The graph below illustrates this expansion, with hydro capacity remaining constant and wind being responsible for the majority of the increase. Tidal power is at the prototype testing stage and currently contributes very little, but the potential from tidal energy, especially in the Pentland Firth is estimated at 1.9 GW . Scotland, as with all northern European countries, has a cool climate and much of the domestic energy use is for heating. Well insulated homes drastically reduce heat energy consumption. 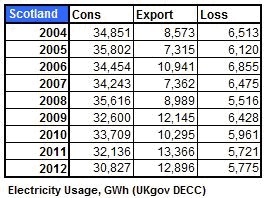 Figures 1 shows an 11.5% reduction in electricity consumption between 2012 and 2004. This is an indication that reduction initiatives may be working, but may also be a result of thrift during an economic downturn. The rapid increase in wind turbine installation, and grant assisted improvements in home insulation plus micro renewable generation, indicate that the continuation of trends towards lower consumption and increased renewable share are highly probable. The current installed onshore wind generation of 4.7 GW is soon to be augmented by a further 0.5 GW under construction, 3.3 GW approved for construction, 4.3 GW currently in planning. The current known potential of 12.8 GW can be included for the short term . The Scottish government initiative ‘Blue Seas – Green Energy A Sectoral Marine Plan for Offshore Wind Energy’ , has identified 5 GW of development in six areas which exhibit favourable potential. In addition to this, the ‘Sectoral Marine Plan’ has identified 25 areas for offshore wind development. 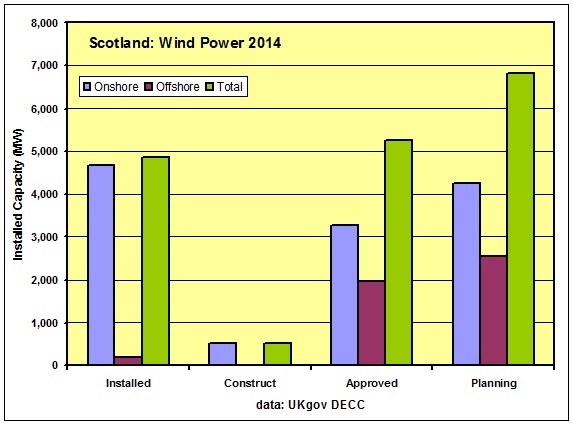 Estimates of Scottish total offshore wind energy potential are in the region of 206 GW. The majority of large scale renewables projects are located near the larger urban areas of Scotland, where the interconnecting transmission grid has the capacity to link new generators to existing large loads, towns and cities. 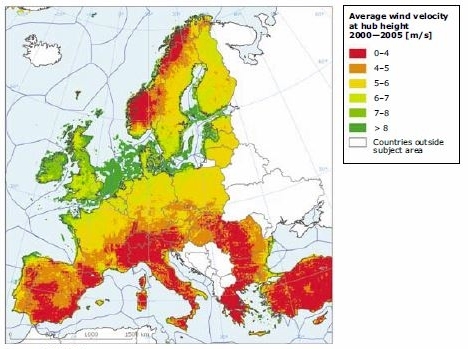 However, the areas with the greatest potential for wind and wave power lie at the sparsely populated and infrastructure poor northern and western extremities of the country, including the Western Isles which confront the fierce open Atlantic. Significant infrastructure investment would be required to tap into this vast resource. As I have illustrated, the more easily accessible sites near urban centres are being developed, and significant further development here is possible. Once this has been exhausted, then the more expensive to connect, remote areas, may be developed. The limit to urban developments is affected by density of turbines and the tolerance of people living close by. Currently the majority of people in Scotland and the UK are in favour of wind energy. As reported in the Guardian newspaper in 2012, an Ipsos Mori poll found that 66% were in favour and only 8% against . Tourism contributes £11 billion towards the Scottish economy annually , and some have claimed that wind turbines will discourage tourists from visiting. However, another Ipsos Mori poll surveyed tourists in 2002: Unaware of windfarms (60%), Windfarms have positive effect (55%), Ambivalent (32%) and Negative effect (8%). In fact 80% of tourists said they would like to visit a windfarm . Scottish Renewables website, Hydro: What is Hydro?